Your roof is essentially your home’s shield from the elements. As the years go by, it will be exposed to rain, hail, heavy winds, ice, snow, and even damage from the sun. Long Island weather can also suddenly change, sometimes drastically within just one week. All of these factors can affect the condition of your roof over time. Don’t you think that it’s time to take care of your roof or replace it? Z Best Roofing has the decades of experience in the industry to bring the most fitting roofing solution to your home. If your roof has faced too much damage, like constant, significant leaks or shingles that are starting to curl away from the roof itself, you may need a replacement. There are a variety of other reasons to have a roof replacement done as well. These include having more than one layer of shingles, an inefficient roofing ventilation system, debris and mildew on the roof itself, and water damage in your attic. To meet all the needs of our customers, Z Best Roofing offers both partial and full roof replacements. 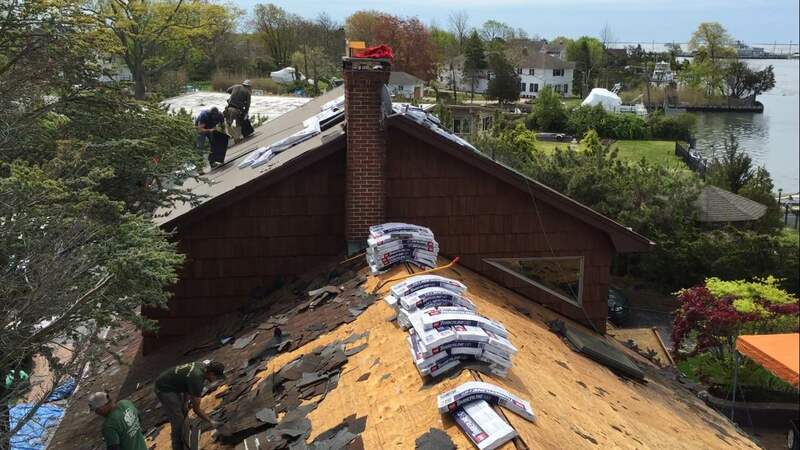 We usually recommend having your roof replaced every 15 to 20 years. Our company offers a free roofing ventilation system with every roof we replace, which is an amazing value. This brand new ventilation system will actively work to prevent your roof from retaining moisture, avoiding mold problems in the future. Your property, fixtures, and home will be fully protected as our team works on replacing your roof. We specialize in proficient repairs, taking as little time out of your day as possible. You’ll be able to admire your new roof and enter your home again in no time. For our roof replacements, Z Best Roofing has an extensive selection of materials and colors to choose from. You’ll be able to pick something that fits both the look of your home and your own preferences. A new, replacement roof will bring more beauty to your property while protecting you and your family from leaks, as well as other complications.